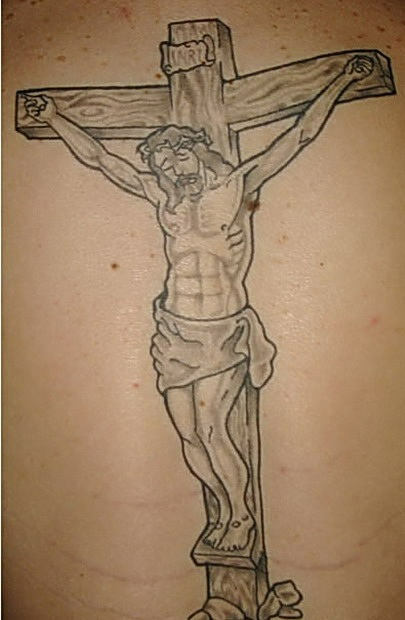 Tags: Crucifix tattoo, Denver Works, Romans 5:8, What defines me?, What defines us? Without any hesitation, a hand shot into the air. “I’d get the names of my kids,” another voice answered. “I’d get a crucifix,” a man in a suit replied. Two or three times a year, I speak for a very special group of people. All of the participants are unemployed and attending a morning Employment Ready workshop through a ministry called Denver Works. The demographics vary every time I’m there. Occasionally, white collar workers attend, but usually the listeners consist of blue collar-type people. Due to the poor economy over the last few years, attendance has been higher than normal. Sitting in the back of the room waiting to speak, I noticed that all my listeners were men in their 20s and 30s. Most of them had just been released from jail. Speaking before a group of recent ex-convicts can be a little intimidating. But I find they can be extremely refreshing if they have a faith in Christ—which was the case in this situation. The men were volleying Scripture passages back and forth and sharing their need for Jesus in order to get a job and stay out of jail. As their training came to a conclusion, I knew my audience that morning would be warmer than most churches. Rolling up my sleeve, I showed the men that I sported some ink just like them. It was a crucifix. That morning, I explained that getting a tattoo was one of the most spiritual experiences of my life. I wanted a reminder of what Jesus did for me two thousand years ago. But I also wanted a reminder of what defines me. 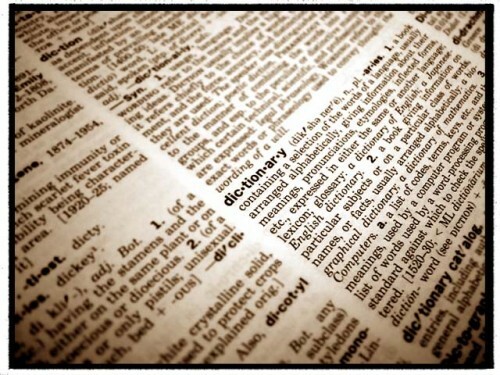 All of us gravitate toward different dictionaries of sorts, that tell us who we are. Some people define themselves by their jobs. Other people define themselves by the status of their relationships. Still others define themselves by their good or bad conduct. Two weeks ago, my wife and I spent the whole weekend arguing (my ex-convict listeners were surprised that a pastor would fight with his wife). By the end of the weekend, I felt exhausted and demoralized. But halfway through the next week, the Holy Spirit spoke to my heart. I realized that I was defining myself by my wife’s opinion of me. I can’t blame her for that. Suddenly I was reminded of the crucifix on my arm. Nothing, no one can define me except Jesus Christ. God loved me so much that he sent his only son to die on a cross to forgive me and win the right to define me for himself. It doesn’t matter if you’re an ex-convict. It doesn’t matter if you willingly choose to reject God’s love. It doesn’t matter if you’re an addict, an adulterer, unemployed, or an “upstanding” church attender. God loves you–and you can’t do ANYTHING to make him love you any more or any less. One of my favorite verses in Scripture is Romans 5:8: “But God demonstrates his own love for us in this: While we were still sinners, Christ died for us.” Did you see that? God didn’t wait for us to get our act together before sending Jesus to earth. He sent him while we were still sinners. Feasting on this truth with my new ex-convict friends, we all realized we were sharing a holy moment. Only God can define us because we belong to him. He created us, but he also purchased us. Michael J. Klassen is a freelance writer and co-pastor of The Neighborhood Church in Littleton, Colorado. Well said, Mike. I have a small wooden cross that, though I can’t wear it, except in my heart, reminds me of who I belong to as well. Thanks. Ashes to ashes. Dust to dust. (~Genesis 18:27) The Lord giveth and the Lord taketh away. We enter this world with nothing, and we’ll leave it in just the same way. edit: … beginning in the 4th grade, living in a new town.